John Kelly retired from HM Diplomatic Service in 2000 having served overseas in the Congo, Egypt, Germany, Australia, Belgium, Grenada, Bermuda, and Turks and Caicos Islands. John was in Cairo during the 1967 Six-Days War. He was the Resident British Representative in Grenada from 1982 to 1986 and was the only western diplomat there when the revolutionary government collapsed followed by the US-led Rescue Mission. From 1989 to 1994 he was Deputy Governor of Bermuda. His last overseas appointment was as Governor of the Turks and Caicos Islands from 1996 to 2000. He was made a Member of the Order of the British Empire (MBE) in 1984, a Lieutenant of the Royal Victoria Order (LVO) in 1994. and a Companion of the Order of St Michael and St George (CMG) in 2000. He graduated from the Open University (BA Hons. (Open)) in 2013 having studied international relations and world history. 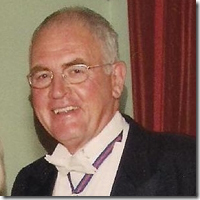 From October 2002 to July 2007 John was Chairman of the Victoria League for Commonwealth Friendship and is now a Deputy President of that charity. His main lecture field is on matters related to the West Indies and Central America, the trans-Atlantic slave trade, and the British Overseas Territories and to his experiences in his diplomatic career. Five of Britain�s remaining �colonies� are in the Caribbean � each with a Governor. This lecture relates some of the everyday experiences in the life of the Governor of Turks and Caicos Islands and his spouse. John Kelly was Governor there from 1996 to 2000. The lecture tells of the colonization of the BWI and the melting-pot of people who make up the populations of the English-speaking islands of the Caribbean and Bermuda. Grenada�s history from Columbus to independence in 1974 and to the present day is typical of the colonial histories of many of the Windward and Leeward islands. Grenada was fought over by the French and British in the 18th century and was a British colony until 1974. Taken to independence by a despot who was overthrown in 1979. Revolutionary Grenada was an irritant to President Reagan who authorised a military invasion in 1983. John Kelly was the UK�s representative on the island from 1982 to 1986 and was there throughout the period when the Prime Minister and other government Ministers were executed during a bloody coup d�etat followed by an invasion led by the US in October 1983. 5. The Trans-Atlantic Slave trade. 6. Portugal and the Slave Trade. The Portuguese were involved in the African/Atlantic slavery for two hundred years before England and, through Brazil, were still at it fifty years after Britain abolished slavery in 1834. The heart-rending story of the many waifs shipped from Britain and Ireland to work on tobacco plantations in the American colonies and the Caribbean is largely forgotten - overshadowed by the African slave trade. The descendants of the Indian and Chinese coolies that were imported to replace the slaves make up a large portion of the populations of the West Indies, North America, Fiji, South Africa, and elsewhere. 8. Baltimore and the Barbary Pirates. This lecture is about the activities of the Barbary pirates in the 17th and 18th centuries. These pirates enslaved more than 2 million Europeans captured in raids on settlements in northern Europe. It includes the story of the villagers of Baltimore in County Cork who were shipped to the slave market of Algiers by Barbary pirates in 1631. 9. Cayman Islands and Jamaica. Cayman�s development into a tourist destination and important finance centre. This lecture also tells of Jamaica�s historical place in the British West Indies. 10. Costa Rica and Panama. Hear how Costa Rica became the �jewel� of Central America. Panama�s chequered past makes for an interesting story. This is the story of Cuba�s colonial past, the wars of independence, and the Fidel Castro revolution of the 1950s and Cuba's current relationship with the USA. This lecture tells the interesting history of this mid-Atlantic British Overseas Territory. Today the population enjoys a sophisticated lifestyle and has the world�s second highest per capita income thanks to the foundations laid by the early settler families - the �40 thieves�. The presentation highlights some of the US/UK summit meetings held in Bermuda since WWII. The �Golden Age of Piracy� 1650 � 1720: This lecture looks at the lives and adventures of some of the well-known pirates and privateers, Henry Morgan; Bartholomew Roberts (Black Bart); Ann Bonny, the naive and infamous William Kidd and the renowned world cartographer William Dampier. 14. William Dampier, Buccaneer and Cartographer. This lecture grew from Dampier�s inclusion in a more general lecture on Pirates and Privateers. He is an interesting character and deserving of a separate lecture. As the holder of awards in three Orders of Chivalry - CMG, LVO, and MBE, - John Kelly offers some insights into the British honours system and explains how to make recommendations for such awards. 18. Migration to and from the UK. This lectures attempts to debunk some of the myths about migrants and their impact on the UK�s economy and quality of life. This lecture is a brief history of Zanzibar and its involvement in slavery in East Africa. Tippu Tip is the most renowned of the 19th Century slave traders. 20. Madagascar and the English Pirates. A number of pirates settled in Madagascar when they were driven from the Caribbean. This lecture looks at the impact they had on Malagasy society at a time when little was known about the island. This lecture is about the building of a nine-hole golf course �Waterloo� in Grand Turk when John Kelly was Governor. He designed and built the course with the help of a few expatriates and with the use of volunteer prison labour. It is of interest both to golfers and gardeners. A wilderness of 40 acres was transformed into a challenging 9-hole par three golf course beautified by many exotic tropical plants. John Kelly relates stories about some of the more unique and unusual events he experienced in his diplomatic career. These include several encounters he enjoyed with Heads of Government and with HM the Queen and other members of the Royal Family. I have lectured on 17 cruise ships since 2007 giving an average of 6 lectures each voyage. The subjects have mostly related to the Caribbean countries and to the British Overseas Territories, Slavery, Pirates and individuals such as William Dampier and Robert Burns.